Disk brake pads need to be parallel with the rotor, and close to but not touching the rotor. Many calipers are self centering but even then, the adjustment can be off sufficiently that the brakes bind or squeak. Before you adjust disk brakes, make sure the wheel is sitting properly in the dropouts and the quick release skewer is closed. This may even cure your problem! There are two types of attachment for disk brake calipers. On one, the caliper attaches to an adapter, and the adapter fixes on to the disk mount tabs on the bike’s frame. On the other type, the caliper attaches directly to the disk mount tabs. Generally, calipers which use an adapter to attach are adjusted by loosening the caliper-to-adapter bolts, which then allow the caliper to slide from side to side. Once the two bolts are loose, hold the brake lever on and then tighten the bolts down again. This gets the caliper mounted in pretty much in the right place. For the fine adjustment, look down through the caliper body to the pad/rotor contact point and adjust so that there is an air gap on both sides of the rotor. Good lighting helps here, as does a white surface the other side of the caliper, so that the gap is more visible. Direct-mount calipers have to use shims (very thin washers) to change the side-to-side position of the caliper. These shims thread on to the fixing bolts between the caliper and the frame’s disk mount tabs. This system is harder to adjust, but once it’s set up, it rarely goes out of adjustment. In fact, if you are only just starting to have problems with a bike that has this setup, check that there isn’t something else wrong before you make adjustments. Shims typically come in 0.2mm and 0.5mm thicknesses. You may need spare shims if you need to adjust the caliper closer to the center of the wheel. With this type of caliper, the main adjustment is to ensure that the caliper is centered over the rotor, with the pads parallel to the rotor. With this adjustment made, there’s little else you can do. 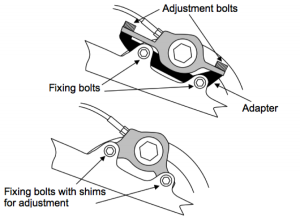 Post-mount calipers are much more common on modern bikes, both on the forks and on the rear. These work the same as calipers that use an adapter. You just loosen the two bolts that attach the caliper to the posts, and then you can adjust the caliper from side to side. Older calipers and some cable actuated calipers have one stationary pad and one moving pad. In this situation, you typically adjust the caliper to be centered over the rotor, then screw the stationary pad in until it has as small a gap as possible with the rotor without rubbing. Adjust the moving pad so that in its off position it is close to the rotor, and so that it gives good stopping power when grabbed. Cable actuated calipers typically adjust the moving pad by changing the length of the cable with barrel adjusters at the caliper or at the brake lever. The procedures above assume that your pads are not worn down, and that your caliper pistons (the bits that push the pads against the rotor) are not sticking on or off. Adjustment is more difficult with worn pads, and sticking caliper pistons make it nearly impossible. Fix sticky caliper pistons by removing the pads, holding the good piston in place, and pumping the lever until the sticky piston moves. Push it back (carefully, it’s brittle) and do the same a couple more times. Do not lubricate calipers- this will harm their rubber seals. If your disk brakes have always squeaked, try changing the compound of the pads you use. There are two main types – organic and semi-metallic. Organic typically squeak less, but sometimes switching to semi-metallic seems to clear up the noise. If the pad change doesn’t do it, and you have direct-mount calipers, you may need to make sure your disk mount tabs are perfectly perpendicular to the wheel axle. Even a layer of paint on the tabs can make the whole caliper off-axis. Good bike shops will have the special facing tool needed to carry out this work. Check that all the bolts are tight before you ride. On higher end hydraulic brakes with two moving pistons, you can often save a lot of time by helping the pads to re-center themselves. Before making any of the changes above, try carefully pushing the pads all the way back into the caliper with a smooth (wooden/plastic) tool. Careful – pad material is brittle! Do this with the wheel removed, then re-install the wheel, spin it, and pump the brake a couple of times to bring it back to life. Make sure your pads haven’t worn down so far that they are through to the backing plate. Also make sure they haven’t worn down unevenly with a lip remaining at the top, beyond where the rotor reaches. This lip can stop the pads from even engaging against the rotor if it gets deep enough. If your pads have little springs between them to push the pads apart, check that the spring hasn’t got bent inwards so that it rubs against the rotor.